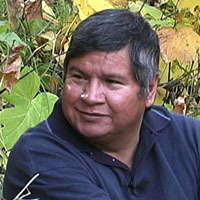 Narcisse Blood is an educator at Red Crow Community College and represents the Blood Indians of the Canadian Blackfoot Confederacy. He aims to provide his people’s perspective based on their language and the experiences and stories that have been passed down from one generation to the next. Language and Worldview - Narcisse Blood.